Monasterevin AFC come from a unlucky 1-2 loss at home against Naas AFC White. Derry Rovers has yet to win in this competition. Rathangan AFC's last result was a crushing 13-1 win at home against Moone Celtic. Naas AFC come from a poor 3-0 loss away against Rathangan AFC. 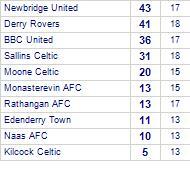 Rathangan AFC's last result was a comprehensive 4-0 win at home against Arlington AFC. Rathangan AFC's last result was a poor 3-0 loss away against BBC United. Monasterevin AFC come from a narrow 2-1 win at home against Rathangan AFC. Kill Celtic beaten by Rathangan AFC. Rathangan AFC despatch Moone Celtic.